Was craving pizza the other day, but remembering how greasy and dough-y carry out pizza is, I immediately changed my mind. However, over the weekend we went grocery shopping and I bought some pizza dough. I was determined to make pizza – at home. 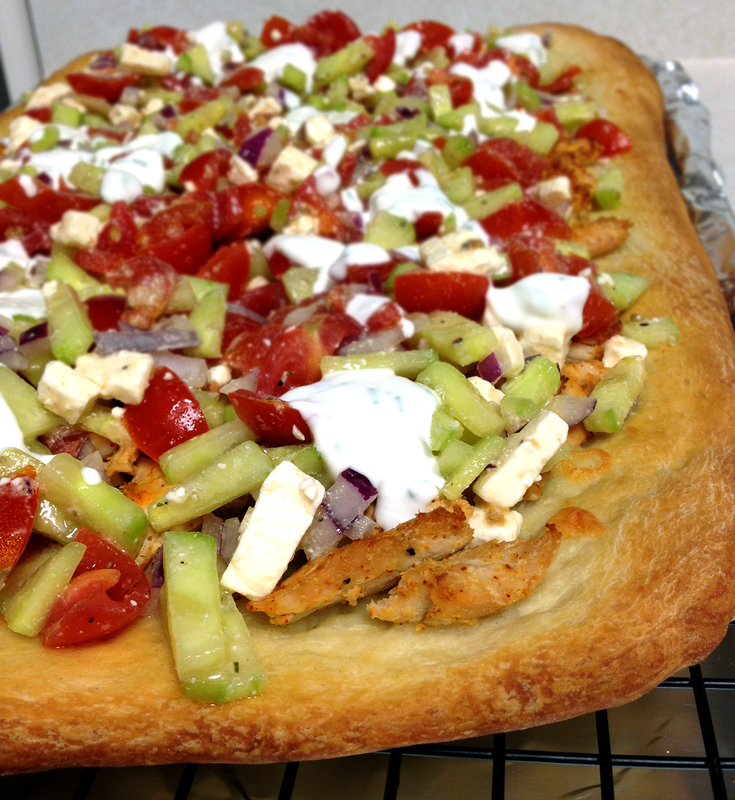 Hubby and I used to go to this pizza place and he liked their Greek style pizza, which they ended up taking off the menu by the way, so I decided to re-make it for him. This pizza turned out to be so refreshing and good that I don’t think I’ll ever order pizza from a restaurant again. This recipe calls for roasted chicken, but if you are a vegetarian you can leave the chicken out, it will still be delicious. The quantities in the recipe are approximate, use as much or as little of the ingredients (especially the topping) as you like. In a large bowl, add shredded rotisserie chicken and add a spice blend of 1/2 tsp each of cumin, garlic powder, paprika, and salt. Mix well, set aside. Place rolled out pizza dough on a baking sheet, place in oven for 7 minutes. It is important to pre-bake so that the dough is not raw in the middle, under the cheese. Place the chicken and some shredded mozzarella cheese on the pizza and bake until golden brown. Meanwhile chop all the vegetables and toss in Greek salad dressing and chill in the refrigerator. In a small bowl combine Greek yogurt, lemon juice, salt, and dill. Mix until creamy. Set aside. When the pizza comes out of the oven top with vegetables, black olives (if using) and feta cheese, and drizzle with the yogurt sauce.